To promote positive perceptions and increase the quality of life in the greater Syracuse area. 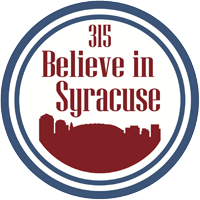 Believe in Syracuse is a 501(c)(3) non-profit organization. Our mission is to promote positive perceptions and improve the quality of life in the Greater Syracuse Area. With over 3,100 email list subscribers, more than 7,400 Facebook fans and more than 200 individual members, we engage with a diverse group of people about what they love and what we all love about Syracuse. We convert that energy and excitement into community service and neighborhood programs that improve the quality of life in the Greater Syracuse Area.